Send an e-mail to us here at Revision and you could be the proud owner of a brand new Bullet Ant Deluxe Kit. Here's how it works: Send an e-mail to us at fans@revisioneyewear.com that says "ARNIES" and lists your username and you are automatically entered in the drawing. Easy, right? At 12:00 p.m. EST on Wednesday May 11, 2011 we will randomly select one of the e-mails that were sent to us and that person will be the winner of the Bullet Ant Deluxe Kit. Please note that a single e-mail address can only be entered in once. Go. 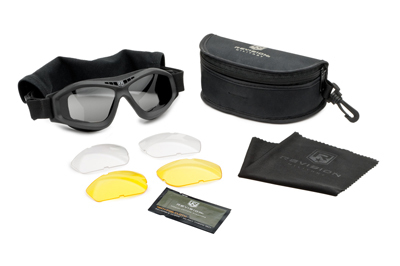 Notice: By entering this contest you agree to receive future promotions and information from Revision Eyewear. I tried sending a mail yesterday but it got rejected. Seemingly Yahoo addresses aren't allowed. Hey Pistol_Dude - You should be able to send an e-mail to the fans@revisioneyewear.com e-mail address through a Yahoo account. If you're still experiencing issues trying to send us an e-mail, then just send us your e-mail address in a private message and we'll make sure to add you to the drawing. Thanks for the great response everyone, we've already seen quite a few e-mails come through our inbox. If you haven't already, don't forget to take a few seconds this weekend to send us an e-mail at fans@revisioneyewear.com. If you send an e-mail to that address with your username and the word "Arnies", then you'll automatically be entered for a chance to win a Bullet Ant Kit. Don't miss out on this quick and easy chance to win some Revision gear. Congratulations to SpookyAggie for being picked as the winner of the Revision E-mail Contest. Be on the lookout for a private message from us on how to receive your prize. Thanks to everyone who participated, we were psyched to see such a big response to the contest. Keep your eyes on the Revision forum for more chances to win free gear.